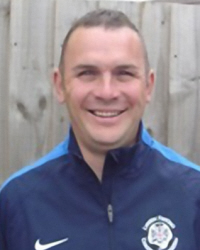 As many of you must know by now, the club has a new First Team Manager, Richard Masters. Richard has already taken his first training session and has arranged a number of pre-season friendlies. "First of all I would like to thank everyone involved at Club for the opportunity to work at Buntingford Town FC. I would also like to wish my predecessor Laurence Salmon all the best for future, especially after his and the team’s achievements in winning the league last season. It is always an exciting time for any manager when they take up a new position at a club no matter what level you are coaching at, and I am very excited by what that lies ahead for the coming season. As you are all aware the club the has been promoted to the Premier Division of the Herts Senior County League and when doing so the first objective is to look to stay in the division and build a strong foundation going forward; anything above and beyond this is always a bonus. With the players we have at this club I believe we are in a good position to do this. Pre-season is now underway with training twice a week and with friendly games arranged against Harpenden Town and Flitwick Town to mention a few; this will give us plenty of time to work as group and get ourselves up to match fitness before the season starts on the 15th August. I look forward to working with everybody at the club by carrying on the hard work that has already been put in place by others, and cement our place in the Premier Division."